This year, like many years in the past, there is a January Coffee Tumbler. You get free coffee in it. Here it is on StarbucksStore.com. You can go to Starbucks with it (once a day) and they’ll fill it free. My understanding – and I’ve been told this by many partners – it includes modifiers. This means if you like your Blonde Roast brewed coffee with vanilla syrup, there is no additional charge for the syrup. I’ve been told that even includes an add shot modifier. I don’t know the answers to all those questions. What I do know is this: This year’s January Coffee Refill Tumbler will include both hot brewed coffee and iced coffee. This is what Starbucks has told us in a tweet. (A big thank you to the blog reader who flagged my attention to this). I wanted to pass this on because it’s good to get some clarity around the tumbler: Hot coffee and iced coffee can go in it for free. By the way, I’ve been told by a partner that the tumbler works for red eyes, coffee mistos, and hot tea – it makes no sense to me that iced coffee, hot coffee with modifiers, hot mistos, hot tea would all be included and not iced tea. 1. Hot tea – Hot water and a Teavana hot tea bag. 2. Iced Coffee – I think that iced coffee has always been considered a brewed coffee for purposes of this tumbler – and at this point, the tumbler code (775) will count iced coffee as a free brewed coffee. You can see my iced coffee this morning (image to left) was included with the January tumbler. This appears to be a recent register update. This includes modifiers also, such as adding in an add shot. 3. Hot coffee – including all modifiers such as add shots, syrups, and even a caffe misto. The World’s Largest Date at Starbucks: Friday the 13th 2 PM to close. The Sweet Receipt is Back: $1 Pastries after 2PM at Starbucks with your Sweet Receipt. I believe the tumbler to be a great idea but perhaps because of all the confusion it isn’t a well executed one. @Michelle Nyhan – I totally agree. I don’t like putting a spotlight on when Starbucks poorly executes an idea, but if we talk about it now, maybe it will get cleared up for 2016, if there is a 2016 coffee tumbler. Yesterday, I used my tumbler to get a coffee with an add shot of espresso – no problem. Same store today, I ordered the same thing, and the partner rang up my grande coffee, tendered out the check, then tried to charge me for a solo espresso. I told her it was included in the discount, and while she admitted that the discount code would take off all modifiers added to the grande coffee, “they weren’t supposed to let customers have anything except a brewed coffee.” This was from a many year partner (pretty sure she’s been with the company almost 10 years). She acted like she was doing me a favor by not charging me for the add shot in the end. I was very disappointed, and as a former partner, I’m guessing that the communication was not clear in what is allowed for this discount. It’s a great deal, even without modifiers I will have the tumbler pay for itself, but I was concerned that if I hadn’t been confident about what was available, they would have charged me. I will be speaking with the store manager the next time I see her, but I do feel like this is again very poor execution. What I really hope is that this dialogue will help Starbucks get it right, if there’s a 2016 coffee tumbler. Will you be writing an article on the new drink “flat white”? I have a call into Starbucks corporate about this. I have given the January tumblers as gifts to friends/family and business clients, and now these folks are telling me they are being hassled at several locations about requesting Iced Coffee – this is completely unacceptable. The recipients of this ‘gift’ from me now feel embarassed/confused/angry as they stand in line at various locations and are told “no, i’m sorry, iced coffee is not included, but here, I’ll just do you a favor and take care of it”…this is NOT a favor, the person feels like they are asking for something they somehow do not deserve, it’s the opposite of how it was intended. I will NOT stand for this, and I will NOT stop until corporate at SBUX HQ does something about this – the stores are told to use Code 775 at the POS, and yet, that code is supposed to be for hot coffee only…they either need a new code that accommodates every acceptable type of use for the January tumbler, or they need to expand the definition of code 775 to include everything that it should entail (iced coffee, tea, iced tea, modifications, red eye, black eye, whatever)….Starbucks Melody, we would all VERY much benefit from you inquiring separately about this as well, because it is truly an insult to me as a business owner and a consumer, trying to gift something special to people, and then have them be treated like outlaws every time they come to the counter. It’s shocking, and I’d bet that Howard Schultz and team, if they knew this was going on, would NOT stop until the issue was remedied once and for all. @Brian – From what I know, 775 will include hot tea, hot coffee with every possible modifier including add shots, syrups, and steamed milk turning it into a misto. Starbucks twitter is telling people iced coffee counts. And actually, given that hot tea counts and that these are all “refill” items, it makes zero sense that iced tea isn’t included – though I’ve not checked on iced tea so I really don’t know. I myself have been totally hassled over iced coffee. Yesterday afternoon, at a store that has a good track record usually but I have no idea what’s going on – every time I walk into this store I see new faces – people seem to come and go quickly from this particular store — It was a bad experience at the register just exactly as you described. This morning, I stopped & got iced coffee with a breakfast sandwich at a Starbucks in the retail core. My attention was divided between the register barista and the partner standing behind him – having a conversation about Instagram. The register barista said absolutely nothing about the code not working for iced coffee, and out of the corner of my eye – as my attention was distracted by the other partner – I saw him hit the RNR button. That’s incredibly great customer service! I believe it’s original purpose was for one hot grande coffee per day. At my store, we’ll try the 775 discount for anything you want to put in it. If the discount works, it works. If it doesn’t, it’s not included in the promotion. Kristen, the problem here is just that, a total disconnect between what you folks in the stores are doing with POS codes and the corporate messaging/marketing and selling of this tumbler promo…the Tweet that Melody provided above from Starbucks’ corporate Twitter account (official account), says that iced and hot are both included…so again, if you are thinking only about codes, then probably 775 won’t include iced…but think about the bigger picture here, the customer that has been sold one thing, and now is being told it is not what it was sold as….see the problem here? Melody, thanks for the nice response…I was totally with you, up until the RNR comment…I may be stupid, but what is RNR, and what is the significance of that button being used today on your visit? I’m not a SBUX employee, so not clear on what this means. Again, sorry if I’m being dense here. I would love to speak to a senior executive at SBux about this issue, it is really bothering the people I gifted this to, thinking it was a Nice Thing To Do For Them (TM). @Kristen – If Starbucks is making statements that it works for iced coffee, then partners really have to find a way to make it work. It might not be comfortable for you, but sometimes making the experience right for the customer is just what’s needed. And I’m not really sure that it’s intended for just hot brewed coffee. Iced coffee is a brewed coffee. And apparently the code works on hot tea too – The tumbler is called a “refill” tumbler and I think the intent is any refill item, imho. @Brian – RNR is a button that is “Right Now Recovery” – It’s used to make a drink or food item free on the spot. Used sparingly, but certainly within the tools of what baristas can do to make a customer’s experience right. First time I got hassled over Iced Coffee = tonight…the 7th night of the promo. Should work on all of them, except Clover brewed (was stated beforehand in a Press Release). I don’t ask for much…I order my coffee black…just honor the promo….any Grande Brewed Coffee. I’ve missed a couple days of going to Starbucks, but I hope tomorrow I won’t get the same blank stare I’ve gotten from three out of four baristas while using the cup. Since half of them didn’t know the code (and since looking at the cup sideways for the code seemed problematic & turning it 90 degrees to read it after filling it with coffee…..) I’ve put that 775 code in big letters on the side. One barista made me feel like feel like she couldn’t be bothered with it while dismissing me as she viewed a couple of regulars behind me in the line. The only barista who got it right was…the one at the franchise or non-stand alone store. He politely told me that his location was not a participating store, but made it right be giving me the free grande brewed coffee. When I make my choice for coffee after this offer is over, I’ll be going out of my way to that franchise store to pay for my coffee. 775 works for iced coffee. That’s what I see to the associate. I asked for an iced coffee and tell them to please ring in a grande iced coffee and then code 775. When it takes it off, it proves it’s okay. @Charles – Thank you for the update!! It’s really quite possible that the registers have been updated. Makes me wonder if iced tea will work? Well, I will test this out tomorrow. Thank you! Melody, let me know if you are able to verify this today before I get a chance to. I will try and verify by 11am eastern time. I was able to get iced coffee with no questions asked today at a new SBUX for me – what I couldn’t tell was whether they used code 775 or not. I’ll need to confirm at my normal go-to store location tomorrow am. Melody, please post what you find on your end. 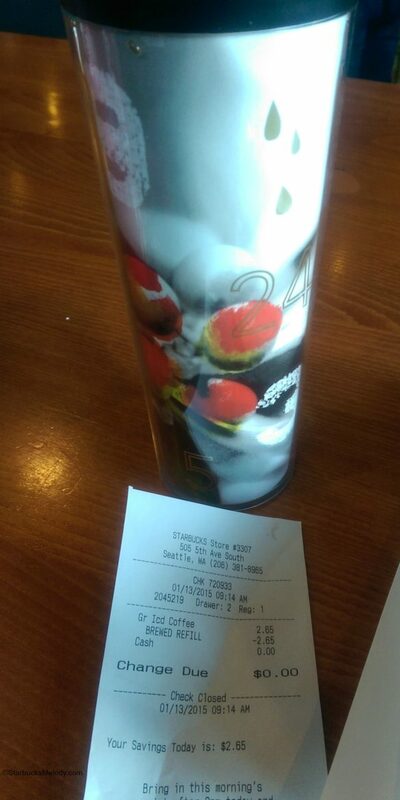 Looks like you can get a receipt with this Tumbler, (handy for Sweet Receipt purposes)? re: 1. Hot tea – Hot water and a Teavana hot tea bag. Also, it should be noted, with the new Teavana hot teas, a Grande hot tea is now 2 tea bags. I got a Refill Tumbler as a Christmas gift and have been using it at most Starbucks. My experience so far has been mostly good, although I’ve not asked to have any modifiers added to it yet. So far just coffee like Christmas blend, Pikes and Komodo Dragon blend. At a Starbucks location inside the Golden Nugget (they have two, one right off Fremont Street and one buried inside the casino) they didn’t take the mug and I was charged $3.23 for the coffee refill (which I got a star from as they took and swiped a physical Starbucks card, but not the app). My local Starbucks here in Murray, UT took the mug on a recent visit, but they were going to charge me $2.35 for a refill until I showed the barista the mug again to ensure she knew it was the January mug. Once she noticed, she cancelled the charge (I never had my app scanned) and I got my refill. I need to ask for a modifier next time I go in. Update on visit today – iced coffee with code 775 went right thru today! Seems to be no problem now, and staff at local SBUX indicated that they are having success now using 775 for hot or iced coffee, as well as hot tea. Iced tea is not included, never was supposed to be. Now the only question is modifications, like a Red Eye or Black Eye, I would be a bit surprised if they were allowed under 775. Their reply- yes u can- I scarfed that baby up!!!! I’ve been using the Tumbler for tea. Most stores have hesitated but usually they say “why not”. A couple of baristas have told me the tumbler is only supposed to be for coffee but they think its silly and they still give people tea in the tumbler. Only once did a barista tell me you can’t get tea (luckily I was in a coffee mood that day). Where do you people live that you want iced coffee in January? !